IT WAS REMOVED FROM A 2004 AUDI A3 8P MODEL 3 DOOR. Get Free Quotes. HAS BEEN IN STORAGE SO WILL HAVE STORAGE MARKS. Audi A3 1.6 FSi 8P 01/05-05/05 ENG:BLF BHP:113 3Dr UP TO CHASSIS NUMBER 8P5200000 (NOT SPORT). Audi A3 1.6 FSi 8P 06/03-05/04 ENG:BAG BHP:113 3Dr (NOT SPORT). Audi A3 1.6 FSi 8P 06/04-12/04 ENG:BLP BHP:113 3Dr (NOT SPORT). Not interested in spending over 100£ on a single silencer?. We have the perfect solution for you. Boot mats with anti slip. Exhaust systems. Exhaust with mounting kit. Fitted in 15 minutes quality exhaust. A3 (8P1) 1.4 TFSI 09.2007 - 08.2012 1390 125 92 YES CAXC, CMSA. A3 (8P1) 2.0 FSI 05.2003 - 06.2008 1984 150 110 YES AXW, BLR, BLX, BLY, BMB, BVY, BVZ. Exhaust Rear Silencer for Mounting kit Our Team will resolve any problems and find the best solutions as soon as possible. Audi S3 8P Rear Silencer. Removed from a 2012 s3. Not interested in spending over 100£ on a single silencer?. We have the perfect solution for you. Wind Deflectors. Boot mats with anti slip. A3 (8P1) Hatchback 2003 - 2010. A3 (8P1) Hatchback 2003 - 2012. IN VERY GOOD CONDITION, REMOVED FROM AUDI RS3 2015 WITH 40,000 MILES. A3 Sportback (8PA) Hatchback 2004 - 2007. A3 Sportback (8PA) Hatchback 2004 - 2013. Not interested in spending over 100£ on a single silencer?. We have the perfect solution for you. Wind Deflectors. Boot mats with anti slip. 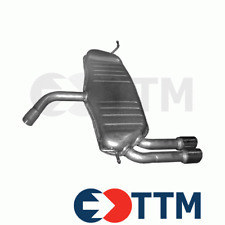 This Exhaust Part corresponds to the image provided and also to the vehicle as displayed in the title of this listing AND in the eBay compatibility guide above. If you are unsure of anything, just click contact us - we will need your car registration number so that we can double-check for you before you buy. If this is not sent before purchase we will assume you have purchased the correct item and dispatch the system for you. This part is supplied WITHOUT fittings - they are displayed on the image for information purposes only. However, a fitting kit is available for this product should you need to add it to your order. SILENCER REPAIR BANDAGE The undisputed worlds number 1 repair bandage. Ideal for larger holes and splits in silencer and exhaust systems. Asbestos free, permanent exhaust repair. Quick simple and easy to use. Specification: Exhaust repair bandage Foil heat shield Fixing wire. Full instructions are given on the back of the packaging but here is a brief into onto how it works: 1. Clean off the dirt and loose rust from the damaged area. Position foil strip over the hole where it acts as a heat shield. 2. Moisten bandage with water until pliable. 3. Firmly wind bandage fully around the silencer with 25mm overlaps to give double coverage over the repair. 4. Retain bandage in position with fixing wire as a temporary support until it hardens under the action of heat from the. Audi A3 (8P1) 1.4 TFSi 09.2007-08.2012 92/125. Audi A3 (8P1) 2.0 FSi 05.2003-06.2008 110/150. In addition, silencers are made of double sheets steel, creating a"silencer in the silencer" - to extend the life of the silencer! Centre Exhaust Middle Silencer Box. 1 x Centre Exhaust Middle Silencer Box. This Centre Exhaust Middle Silencer Box fits the following vehicles. Providing premium car parts for all makes and models at affordable prices. Audi A3 Sportback 1.4 TFSi 09.2007-03.2013 92/125. Audi A3 Sportback 2.0 FSi 04.2004-06.2008 110/150. In addition, silencers are made of double sheets steel, creating a"silencer in the silencer" - to extend the life of the silencer! A3 (8P1) 1.9 TDI 05.2003 - 05.2010 1896 105 77 YES BKC, BLS, BXE. A3 (8P1) 2.0 TDI 05.2003 - 08.2012 1968 136 100 YES AZV, CBAA, CFFA. A3 (8P1) 2.0 TDI 16V 05.2003 - 08.2012 1968 140 103 YES BKD, CBAB, CFFB, CLJA. Full Exhaust System. 1 x Direct Fit Rear Exhaust Silencer Back Box. 1 x Twin Front Exhaust Pipe & Catalytic Converter. 1 x Centre Exhaust Middle Silencer Box. Ready To Help! 2 x Exhaust Rubber Mount. Audi A3 1.6 8P 06/03-05/05 ENG:BGU BHP:100 3dr & 5dr (NOT SPORT). Audi A3 1.6 8P 06/05-08/13 ENG:BSE,BSF,CCSA,CMXA BHP:100 3dr & 5dr (NOT SPORT). EXHAUST CENTRE SILENCER :TO SUIT EXHAUST FITTINGS(HANGER RUBBERS, GASKETS,BOLTS,SPRINGS ECT). A3 Sportback (8PA) 1.4 TFSI 09.2007 - 03.2013 1390 125 92 YES CAXC, CMSA. A3 Sportback (8PA) 1.6 FSI 09.2004 - 09.2007 1598 115 85 YES BLF, BLP. Exhaust Central Silencer for A3 (8P1) 1.4 TFSI 09.2007 - 08.2012 1390 125 92 YES CAXC, CMSA. Direct Fit Rear Exhaust Silencer Back Box. 1 x Direct Fit Rear Exhaust Silencer Back Box. This Direct Fit Rear Exhaust Silencer Back Box fits the following vehicles. Ready To Help! Fits Front Wheel Drive Vehicles. A3 Sportback (8PA) 1.4 TFSI 09.2007 - 03.2012 1390 125 92 YES CAXC, CMSA. A3 Sportback (8PA) 2.0 FSI 09.2004 - 06.2008 1984 150 110 YES AXW, BLR, BLX, BLY, BMB, BVY, BVZ. Exhaust Rear Silencer for Mounting kit. Audi A3 1.6 FSi 8P 01/05-05/05 ENG:BLF BHP:113 3Dr UPTO CHASSIS NUMBER 8P5200000. Audi A3 1.6 FSi 8P 06/03-05/04 ENG:BAG BHP:113 3Dr (NOT SPORT). Audi A3 1.6 FSi 8P 06/04-12/04 ENG:BLP BHP:113 3Dr (NOT SPORT). A3 Sportback (8PA) 2.0 TDI 09.2004 - 06.2008 1968 136 100 YES AZV BKD. A3 Sportback (8PA) 2.0 TDI 16V 09.2004 - 06.2008 1968 140 103 YES AZV BKD. A3 (8P1) 1.9 TDI 06.2003 - 08.2003 1896 105 77 YES BKC. Jetex Performance Exhausts, Since 1986. A fitting kit is provided with every Jetex system. (see pictures). Audi A3 8P TFSI Sportback Jetex Stainless Steel Performance Back Box Exhaust with Twin 80mm Tail Pipes. Direct Fit Rear Exhaust Silencer Back Box. 1 x Direct Fit Rear Exhaust Silencer Back Box. This Direct Fit Rear Exhaust Silencer Back Box fits the following vehicles. Specialist Parts Advisers Ready To Help! Not interested in spending over 100£ on a single silencer?. We have the perfect solution for you. Wind Deflectors. Boot mats with anti slip. A3 (8P1) Hatchback 2003 - 2007. A3 Sportback (8PA) Hatchback 2004 - 2007. AUDI A3 1.2 TFSi 01.2010-03.2013 77/105 Sportback. AUDI A3 1.2 TFSi 01.2010-08.2012 77/105 Hatchback. AUDI A3 1.2 TFSi 03.2010-05.2013 77/105 Cabriolet. SEAT ALTEA 1.6i 2004-05.2010 75/102. SEAT ALTEA XL 1.6 10.2006-09.2013 75/102. 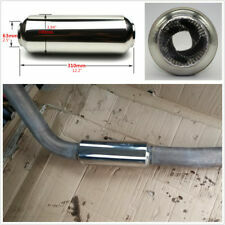 CHROME PLATED TAIL PIPE 35mm min to 48mm diameter max 145mm long Ideal for giving your car a sporty look. Cover up a rusting tail pipe. Replace a corroded trim. Looks fantastic when fitted Simple to fit simply slides over and tightens down onto the original exhaust Comes with fitting clamps PLEASE NOTE BEFORE ORDERING THESE TAIL PIPE COVERS ARE 48mm DIAMETER - YOU MUST ENSURE THAT YOUR EXHAUST PIPE IS NOT LESS THAN 35mm AND NO MORE THAN 48mm IN ORDER FOR THIS PRODUCT TO FIT. DUE TO THE VAST AMOUNT OF CAR MODELS SPECIFICATIONS OUT THERE THE CAR MODELS LISTED ABOVE ARE FOR GUIDANCE ONLY. Also will not fit on pipes that are curved at the end. Fast Dispatch PLEASE NOTE Important notice BEFORE ordering Please DO NOT rely on the compatibility list to make your decision. MIDDLE SILENCER AUDI A3 1.6 150123 A3 MIDDLE SILENCER. Reference OE/OEM Numbers: 1K0253209B, 1K0253209B, 1K0253209B, 150123. Ending Soon. Full Exhaust System. 1 x Direct Fit Rear Exhaust Silencer Back Box. Ready To Help! Available And Ready To Dispatch! 1 x Centre Exhaust Middle Silencer Box. 2 x Exhaust Rubber Mount. 1 x Exhaust Rubber Mount. Function Middle Silencer. AUDI A3 Convertible (8P7) 2.0 TFSI Convertible Petrol 04/2008 05/2013 FWD 16 200 147. Imasaf 47.27.06. AUDI 1K6253609S. VAG 1K6253609S. AUDI A3 (8P1) 1.6 Hatchback Petrol 05/2003 08/2012 FWD 8 102 75. AUDI A3 Sportback (8PA) 1.6 Hatchback Petrol 09/2004 03/2013 FWD 8 102 75. Length 1000 mm. Wheel & Tyre Accessories. Helpful links. Silicone Hoses. Seats & Harnesses. PowerFlex HUb. Panther Silicone Hoses & Tubes. Oils & Additives. Motorbike Tyres. Skoda Yeti 1.4 TSi ab 06.2010 90/122. Volksvagen Golf VI 1.4 TSi 10.2008-11.2012 90/122 Hatchback. Volksvagen Golf Plus V 1.4 TSi 06.2007-12.2013 90/122 Hatcback. Volksvagen Golf V 1.4 TSi 07.2007-11.2008 90/122. AUDI A3 8P 2.0 Exhaust Back / Rear Box 08 to 13 Klarius. AUDI A3 Convertible (8P7) 2.0 TFSI Convertible Petrol 04/2008 05/2013 FWD 16 200 147. Function End Silencer. Imasaf 47.27.07. UNIVERSAL PERFORMANCE STAINLESS STEEL BACKBOX EXHAUST. These are free flow unrestricted stainless steel exhaust back boxes. Quality grade stainless steel. Fast & Free Dispatch from Fastlane Styling London Warehouse. DOOR GUARDS 8 Piece Clear door guards Easy fit Protect cars doors from damage Specially contoured design Dimensions: Large Pieces: 13.4mm x 0.9mm Small Pieces: 6.2mm x 0.9mm Fast Dispatch PLEASE NOTE Important notice BEFORE ordering Please DO NOT rely on the compatibility list to make your decision of parts, as cars come with many variations and fitments on the same make and models. Check things like dimensions size and other stated fitment criteria prior to ordering to make sure you get the correct part as vehicle parts can have more than one option due to changes on chassis / engine number or modification. We cannot be held responsible for wrong parts ordered if you have not carried out the above. If you have any questions about fitment, give us a call or email. These are free flow unrestricted stainless steel exhaust back boxes. UNIVERSAL PERFORMANCE BACKBOX EXHAUST. Quality grade stainless steel. BOX LENGTH - 279mm. BOX WIDTH - 102mm. BOX HEIGHT - 102mm.